Part of the Brookings Institution in Washington, D.C., the Hamilton Project works to advance our country’s promise of opportunity, prosperity, and growth. 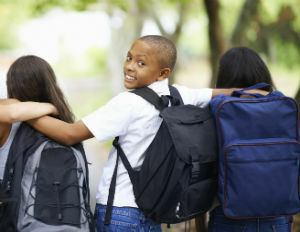 It recently released 14 Economic Facts On Education and Economic Opportunity. Over the next several days, we will examine each of the 14 facts. Fact 2. The skills premium has increased dramatically. The gap in earnings between high school-educated and college-educated workers has more than doubled in the United States over the past three decades. Although other developed countries show a similar trend, the United States appears to have the largest skills premium–that is, the gap between the wages of low- and high-skilled workers. In part, the magnitude of this gap reflects the fact that the inflation-adjusted earnings of workers with high levels of education have risen much more over the past 35 years than have the earnings of less-educated workers, as shown in figure 2. 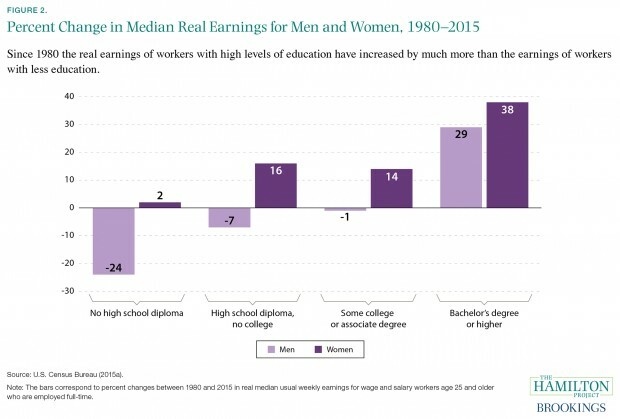 Real earnings for men without a bachelor’s degree have actually fallen since 1980–and fallen dramatically for men without a high school diploma, whose earnings are down by more than 20%. Gains in earnings for women with a bachelor’s degree or an advanced degree were more than twice as large as those for women with a high school diploma, some college, or an associate degree. In recent decades the growing earnings premium for education has contributed substantially to the net growth of earnings inequality. Roughly two-thirds of the overall increase in earnings dispersion between 1980 and 2005 is accounted for by the rising returns to schooling–primarily the growing premium to post-secondary education. Why has the education premium risen in recent decades? Economists continue to study this question, but a number of studies point to the interplay of supply and demand for skills. In The Race between Education and Technology, Harvard economists Claudia Goldin and Lawrence Katz make the case that the U.S. economy prospered during the 20th century in large part because educational attainment kept up with the rising demand for skills, which was catalyzed by significant technological change. Bottom line: For most people, an excellent college education will increase their earning power, especially if their college years cap 12 previous years of academic rigor. Your child’s school isn’t rigorous? Let your children routinely do work two grade levels above.